Bakeware - What Should I Buy? 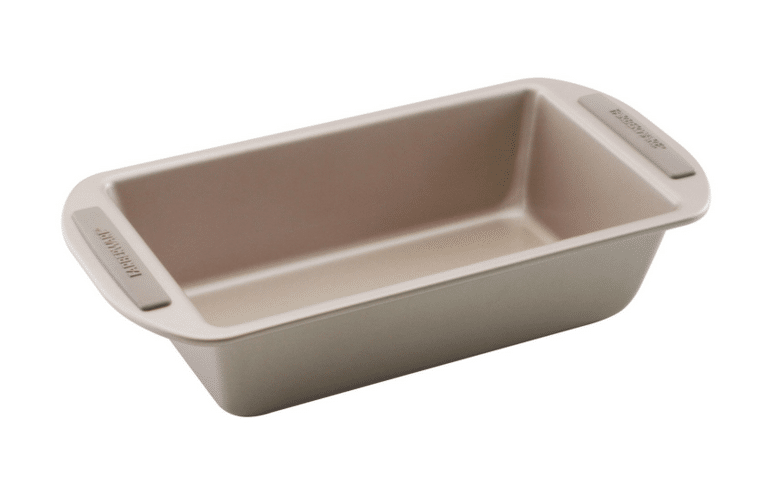 You are here: Home / How To / Bakeware – What Should I Buy? As a follow up to a previous post, Pots, Pans and Cookware, today I am diving into the wild world of bakeware. I often have readers ask me which baking dishes and pans I recommend, especially for a home cook who is just starting out. Answers will vary, because it really depends on what kind of baking you like to do. While I can give some rough guidance and an overview of the types of bakeware on the market, you need to ask yourself what types of baking you do most. Evaluate your own baking habits—is delicate pastry your thing, or are you more comfortable with drop cookies and muffins? Do you like baking pies and cheesecakes? Is easy cleanup important? Once you are clear on the types of baking you do most, it will be easier to figure out which bakeware you’ll need in order to get comfortable in your kitchen. I feel the best way to approach this is to give you a comprehensive overview of the major types of oven bakeware out there, along with their potential uses, to help make the decision process a bit easier. But first, it’s important to understand the different materials that baking pans are made from. Just like with stovetop cooking, it’s important to know what kind of material your bakeware is made from. Most baking dishes are made from glass, ceramic or metal. Glass baking dishes take longer to heat up than metal, but they will keep an even heat for a longer amount of time. They are great for baking cakes, which require even heat at a lower temperature. Glass is heavier than metal and requires a bit more care, as it can crack easily when dropped or if its temperature changes too quickly. 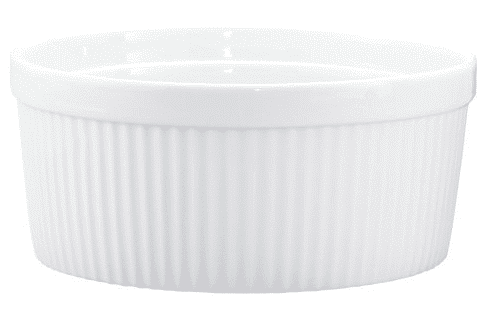 Ceramic baking dishes typically have an enamel finish, which helps with easy clean up. They are durable, safe for high temperatures and distribute heat evenly. You will often see gratin and casserole dishes made from ceramic. Metal baking dishes heat up and cool down quite quickly. This makes them better for baking things like biscuits or cookies, which are cooked at a high heat for a short amount of time. Dull finishes on metal will absorb heat faster than glossy finishes, which explains why cookies baked on dull metal might burn on the bottom before the top is finished baking. 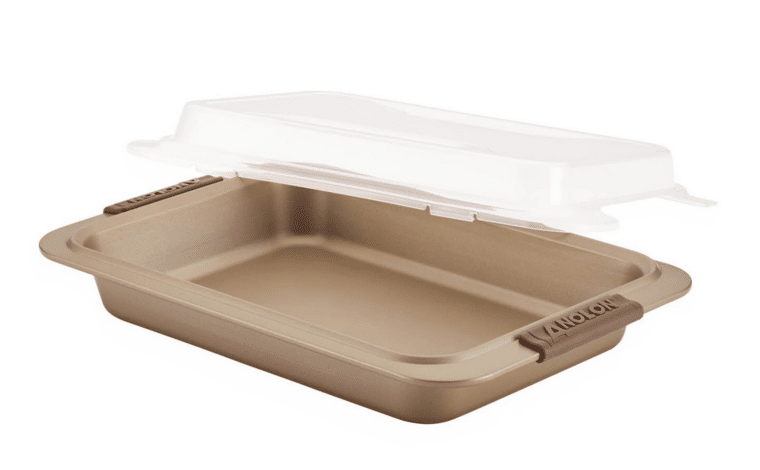 Silicone baking pans have grown in popularity recently. They do not require additional non-stick sprays or oils, and they tend to heat quickly and evenly. They can be used in the oven, stored in the refrigerator or freezer and reheated in the same pan if necessary. They are also dishwasher safe. Silpats, or silicone baking sheets, are also favored in place of non-stick spray or parchment because they heat evenly and are more economical – just wash and re-use. Sheet pans or baking sheets are shallow, rectangular pans, perfect for baking cakes, rolls, cookies, bread, pizza and just about anything you would need to simply heat in the oven. They are offered in both a flat version and with a 1-inch high lip to hold in liquids. I prefer the variety with a lip, which keeps any liquids on the pan– for example, when you’re roasting vegetables (which I frequently do). 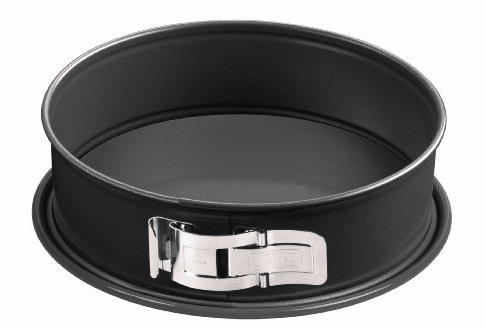 Springform pans are usually sold in a 9-inch size and are composed of two separate pieces – a flat base and a spring collar that latches to close tightly around the base. Once you are finished baking in the pan, you can open the latch and lift the collar away. They are best for foods that cannot be easily removed from the pan by simply turning it upside down, like cheesecake or deep dish pizza. 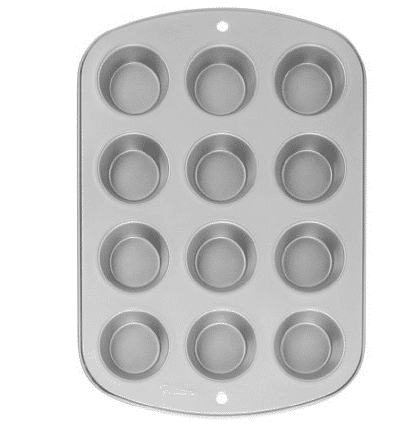 Loaf pans come in various sizes, but are most commonly seen in 8 x 4 inches. They are great for baking bread, of course, and coffee cake. Keep in mind when baking cake recipes in a loaf pan that you may need to increase the cooking time due to the depth of the pan. Bundt pans, or tube pans, are circular pans with an opening in the center. 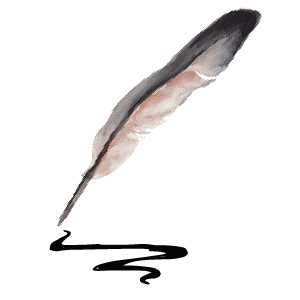 They usually feature fluted or decorative sides. 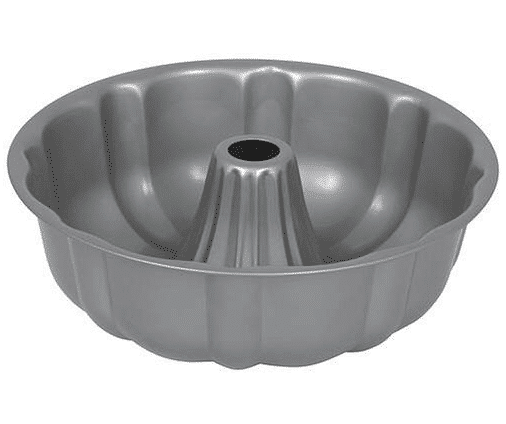 Bundt pans are most commonly used for baking bundt cakes, but have proven to be handy in other areas. The center tube can be used to hold a chicken for roasting, or as a stand for removing corn from a cob while the pan catches the falling kernels. When using a bundt pan, be sure to cover ever nook and cranny with non-stick cooking spray– certain recipes require that you flour the pan as well. A muffin tin is more like a baking mold, usually with 12 cup-like openings that hold about 3 ½ ounces of batter each. They are perfect for cooking muffins and cupcakes, but can also be used to create any single serving dessert – like miniature cheesecakes or individual brownies. They are best when used in combination with paper liners that can easily be removed from the pan, but they also work with non-stick spray. Muffin tins also come in jumbo muffin size, with six muffin cups to one pan. Standard rectangular, square or round baking pans are a must have for baking, from beginner level to expert. They can be used for baking cakes, breads, brownies, lasagna, casseroles – you name it. They come in just about every type of material, color and coating. Pie pans are round and shallow with sloped or angled sides. They help to hold a pie’s shape along with its required fillings. The edges are often fluted, allowing bakers to easily scallop the edges of the crust. Because gratins require even heat, gratin dishes are typically made from ceramic or stoneware. They are quite shallow and round or oval in shape. Their large surface area ensures that a good amount of your gratin is exposed to the heat of the oven or broiler, which helps create that amazing golden crust. Soufflé dishes are round and deep with high, straight sides. They are usually made from ceramic which ensures even heat distribution, and come in large or single serving sizes. The high sides offer a stable base for your delicate soufflés and custards. And lastly, cooling racks, though not exactly bakeware, are an essential piece of baking equipment. Since your baking pans stay hot long after they’re removed from the oven, it’s important to remove whatever you’ve been baking from the pan as soon as possible to avoid overcooked, dry baked goods. 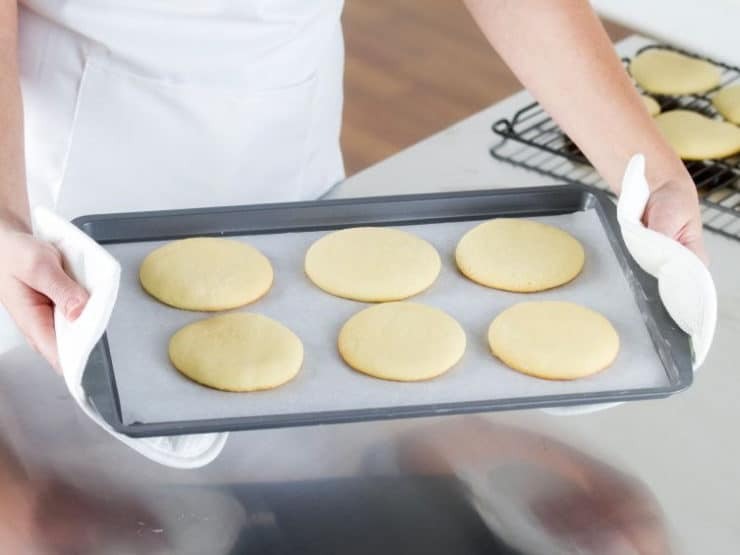 Cooling racks offer the perfect solution and come in many sizes and varieties, from single racks that can sit on your counter top to stackable racks that take up less surface area, while still allowing enough space for every cookie. There are many more specialty baking pans and dishes out there, but the ones listed here are the most commonly used. If you’re stocking your kitchen for the first time, this guide will help you narrow down what you need most based on the types of baking you commonly do. What piece of bakeware do you use most? For me it’s probably my cookie sheets, with casserole dish a close second. great article. I have learned a lot from it. I love the non stick coating and mostly use metal but have some glass for like baked pasta dishes. All my Corningware casserole dishes. I have a few that come with both glass and plastic covers for easy storage. I bought the Baker’s Secret pans many years ago and was very disappointed. They scratched and rusted and the non-stick coating wore off. Stoneware is also great for baking. I especially love stoneware bar pans, similar to the material a pizza stone is made from, for cookies. Do you have a recommendation of the ‘safest’ cookware for say, baking sheets, and springform pans? I don’t feel safe letting my food touch the non-stick or aluminum surfaces, and would love to know if you have an alternative! Most often used would be bread pans for bread, followed by 9 x 13 pans for bar cookies or meats, and cookie sheet for cookies or biscuits. Also use square cake pan for corn bread, baked omelets or breakfast casseroles occasionally. But since I’ve been baking all our bread, the bread pans get the most use. Definitely, my cheesecake pans. Not springform! The ones you push up from the bottom. I have at least 6 of the pans because I bake them 2 at a time. Sometimes I use a plate for my fast food. Does that count? Truly, it is ! I bake brownies and the clean up is so fantastique ! Thanks, Tori! I ordered it. With Amazon Prime they said I´ll have it on May 30th!! Terrific! Let me know how it works out for you. I use sheet pans almost daily. I also use pyrex pie dishes, because there are only two of us, and I can roast two chicken breasts in them perfectly; & cleanup is a snap! 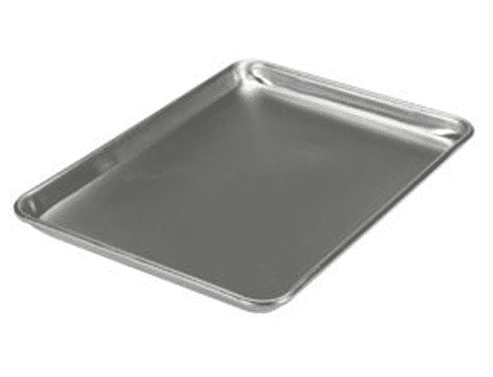 I have two 1/2 sheet pans that I´ve been using for many years….what I´m trying to find and can´t is a metal baking rack that sits on top of that size pan. I want to use it for baking breaded chicken breasts and other items for which you don´t want the food sitting directly on the pan. I have seen *cooling* racks which are not necessary good at high temps or for broiling. 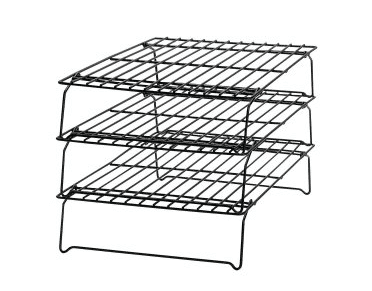 Do you have a source to buy 1/2 sheet baking racks for those size cookie pans? I was surprised that even Restaurant Depot didn´t have them…they sell the pans but not that size rack! Great tips. Any suggestions on Non-Stick Baking Mats – when to use compared to when not to use? Thinking about investing in some. People love them, but they don’t last as long as advertised. They are great for non-greasy foods (in which grease won’t be sliding off the mat and making a mess under the mat). We used ours constantly but were replacing LONG BEFORE the 2000 uses they advertised. You have to make sure you wash well with warm soapy water after using it to keep any foods or greases from baking into the mat. Hi Pamela! To chime in on Dave’s comment, I also have Silpats. I like them a lot, and they’ve lasted me several years (I do take good care of them). I tend to alternate between Silpats and parchment paper, and I always use parchment when taking pictures for the blog, knowing that some folks don’t have Silpats at home. However the Silpats have served me well, particularly for delicate cookies and pastry. They’re great! Sheet pans and Pyrex baking dishes in assorted shapes and sizes. I make a lot of quiche, so my glass pie plates are always out. Just bought two new baking sheets yesterday cos after making bourekas in batches, I realized I needed more than ONE! Non-stick foil. Love it ! It is kind of magical stuff, isn´t it Chris? Cookie sheets, but could not live without the parchment paper too.